Oceanic plateaus form by mantle processes distinct from those forming oceanic crust at divergent plate boundaries. Eleven drillsites into igneous basement of Kerguelen Plateau and Broken Ridge, including seven from the recent Ocean Drilling Program Leg 183 (1998^99) and four from Legs 119 and 120 (1987^88), show that the dominant rocks are basalts with geochemical characteristics distinct from those of mid-ocean ridge basalts. Moreover, the physical characteristics of the lava flows and the presence of wood fragments, charcoal, pollen, spores and seeds in the shallow water sediments overlying the igneous basement show that the growth rate of the plateau was sufficient to form subaerial landmasses. Most of the southern Kerguelen Plateau formed at V110 Ma, but the uppermost submarine lavas in the northern Kerguelen Plateau erupted during Cenozoic time. These results are consistent with derivation of the plateau by partial melting of the Kerguelen plume. Leg 183 provided two new major observations about the final growth stages of the Kerguelen Plateau. 1: At several locations, volcanism ended with explosive eruptions of volatilerich, felsic magmas; although the total volume of felsic volcanic rocks is poorly constrained, the explosive nature of the eruptions may have resulted in globally significant effects on climate and atmospheric chemistry during the late-stage, subaerial growth of the Kerguelen Plateau. 2: At one drillsite, clasts of garnet^biotite gneiss, a continental rock, occur in a fluvial conglomerate intercalated within basaltic flows. Previously, geochemical and geophysical evidence has been used to infer continental lithospheric components within this large igneous province. 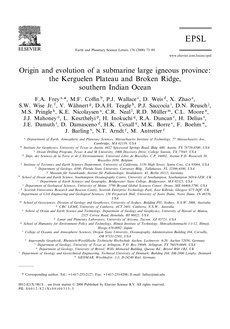 A continental geochemical signature in an oceanic setting may represent deeply recycled crust incorporated into the Kerguelen plume or continental fragments dispersed during initial formation of the Indian Ocean during breakup of Gondwana. The clasts of garnet^biotite gneiss are the first unequivocal evidence of continental crust in this oceanic plateau. We propose that during initial breakup between India and Antarctica, the spreading center jumped northwards transferring slivers of the continental Indian plate to oceanic portions of the Antarctic plate.